It's a flip cardsmith card. Just to let other cardsmiths know, my favorite color is red followed by blue and green. I still like black though. 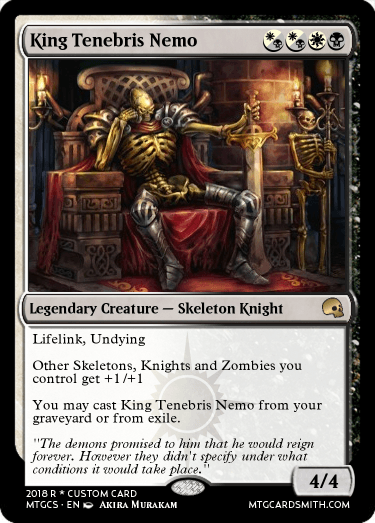 Pretend my card has a "non-legendary" clause and also doesn't trivially go infinite with like 5 different cards. 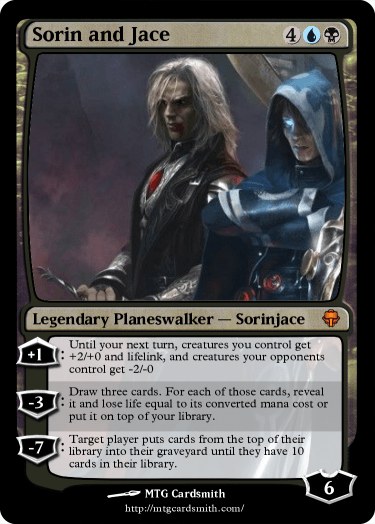 Very nice @Deepsky, though I find it amusing this second card in my likeness with last strike, my nature to put things off is that legendary I guess hehe. (the guy who got arrested for being lazy.) The defender of all existence is the tagline for my character I came up with in City of heroes Lastjustice. Being a time traveler who saves all existence being erased. @baryonyx69 card's reminds me of the evil version of that character, Last Judgment, where he decides be an angel of death and pass judgment on the world. This in the spirit of fun and play on your name heh. 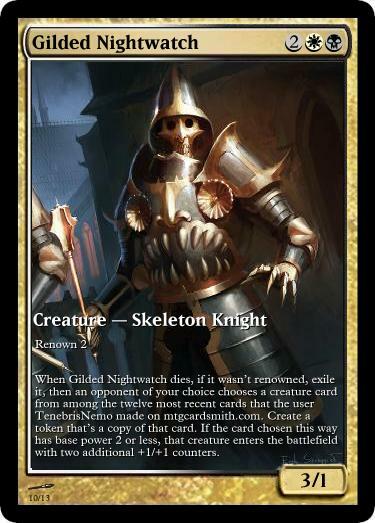 @shadow123 Based off your likes I went with a creature that aids in burning down your opponents. I hope this card isn't offensive or anything, I went off your cards and found quite a few cards that joked about "poo"/toilets/toilet paper. 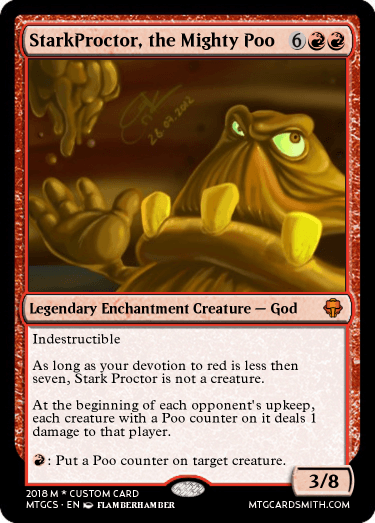 So, well I had to make you a poo god, and it HAD to be red for the extra burning flame feel lol. Anyways I get your humor, hope you enjoy the card man! ps where is your Jason Voorhees card at???? @atrus159 hope you like this card. I didn't know what to do for you exactly, so I went to look artwork up with your name and this was one of the pictures that came up. 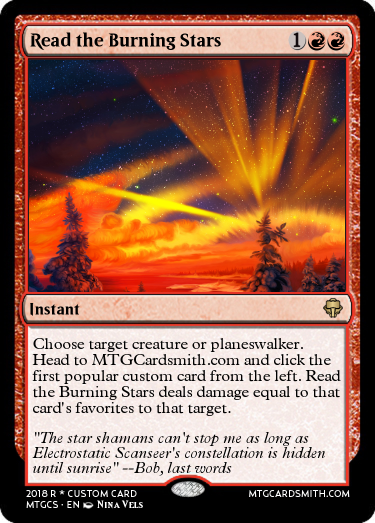 I thought I could use this as an interesting piece for you, maybe not traditional magic looking art but so what, this is all in fun right, I would abuse this card, izzet can be so fun if played right. 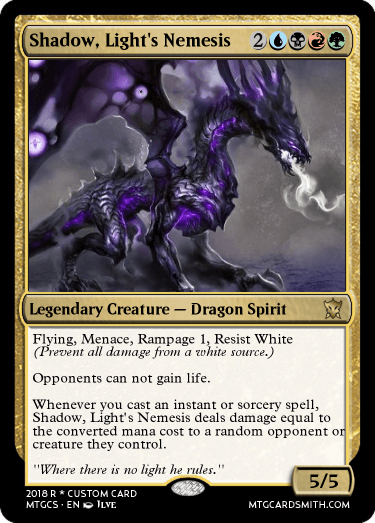 I felt like it had to have some draw back for being such an awesome small card its why it does damage to you but you get to scry 3 and then draw a card by turn 4 and get a creature out of the deal, yes, please! anyways, hope you enjoy the card! Here's the card I made for @Tenebrisnemo! XD Sorry I couldn't make it in mtgcardsmith itself, it took too much space, but I guess it was just too much of a convoluted design :P.
Oh shoot! I forgot to credit the artist! I was holding onto this piece for a while, and when I saw that you were an Orzhov fan, this image snapped in my head immediately! The beautiful person who made this piece is Eryk Szczygieł! I'm planning on making cards with his artwork in the future! I guess this is kind of like an artist spotlight, huh? @ManaChrome - A lovely card indeed! The only sad thing is that I can't add it to the set. But I will remember this piece of art within my memories forevermore! Thanks a ton! You will get yours @TenebrisNemo ...card that is! @Lastjustice - Majestic and strong king! 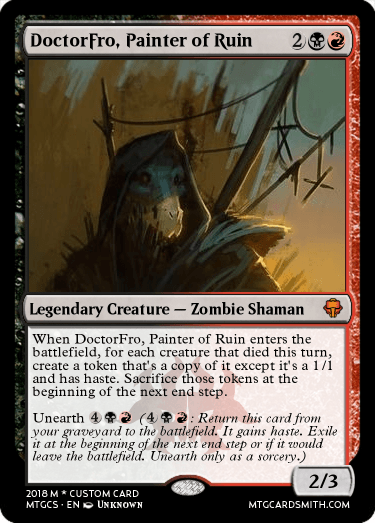 And undying, my favorite mechanic to play with! Excellent work! You have my deepest gratitude! I've create another card for all cardsmiths out there. 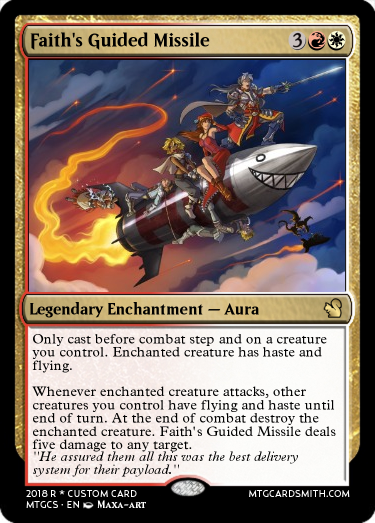 And now @ManaChrome's most favored card is in the flavor text! @TigerFang8 You have alot of Guinea pig and other rodent cards, so that lead to me making this card hehe. Lol @Lastjustice's card. 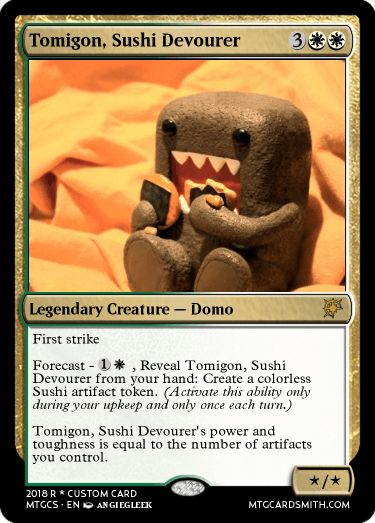 I think I want to make @TigerFang8 a more serious card now cuz I wasn't happy with my card for him, cute isn't my thing--sometimes it is, but rarely. 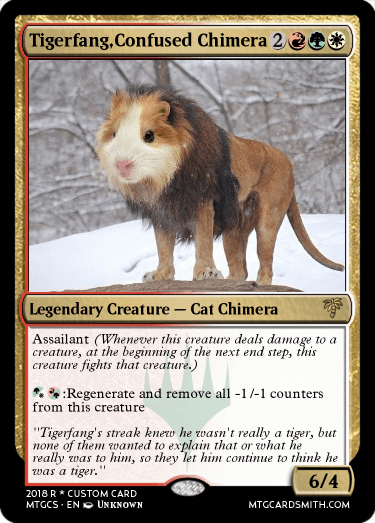 I saw the photo shopped guinea pig/lion picture while looking up Ferocious guinea pig pictures, and the card made itself. Dear lord!..I mean that's cool, very cool. @Lastjustice I can't make cards tonight sadly... It will have to be on Sunday (later on like lunch time). The phone I'm on won't let me upload pics to make the cards now. I gotta wait to make them, but I can favorite and comment on forums! Got any favorite colors/creature types? PS I was talking to @Dechujoh64 earlier I told him when I view his cards and yours his style of cardsmithing reminds me of yours a lot of the time. 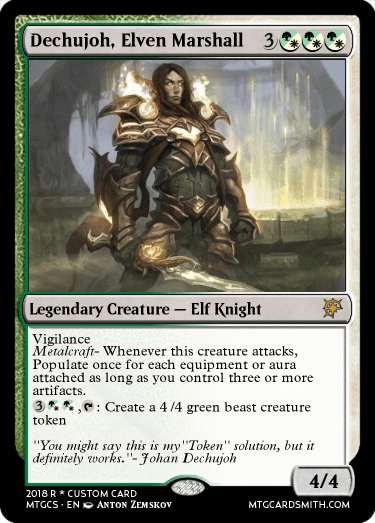 It's the Selesnya force guiding us(I am usually playing some variety of Naya, but heavily green/white). Well you get to things when you can man, I will look forward to it whenever it happens.